As discussed in the previous post proto-Venus first raged throughout the inner solar system less than 6000-years ago, which at that date comprised only a dinosaur-laden Earth and Mars in an interior orbit full of life as we know it today. Although the interaction of Venus with Mars prior to the 3,000-year Vedic Period, was described in myth as Indra (Mars) smashing the foot of Agni (incandescent Venus), its encounter with Mercury at the end of the Vedic Period was characterized as a more intimate one. It was even recorded as a piece of art (Figure 1). Two posts (2013), post1 and post2 , explained the clues left behind by Venus on Mercury. In both instances, Venus left behind significant crime scene evidence, cosmic DNA. As discussed in the last installment, it took the form of the Medusae Fossae Formation on Mars but in the case of Mercury the same ‘DNA’ was deposited. However, because Mercury was super hot and dry, Venus’ hot sulfurous basalt deposit had only the magnetic field of Mercury with which to interact. After ninety-nine captures and releases of Mars in its familiar geostationary orbit of the Earth, when the transfer of all its life-forms, crust, oceans, heavy elements, atmosphere and vegetation to the Earth was complete (687 BC), Mars’ solid core left the planet for the last time. It did not have a chance to zoom around the Earth and catch up to Mars as on the last ninety-nine encounters because it was attracted to Venus. Some romantics might believe it was due to her great beauty, but not to spoil the story it was her rta (gravitational attraction in the RgVeda). The two of them ‘cavorted’ for a couple of hundred years, eventually tiring and settling into their current orbits. Fig. 2 Mercury’s north pole region with 1000 km basalt rise in foreground radar image is the deposit from proto-Venus. When the core exited Mars, it had a powerful magnetic field, which has declined considerably in the last 2,300 years because the solid state superconductors within it needed to be under super-high pressure. (see Death of the Dynamo). 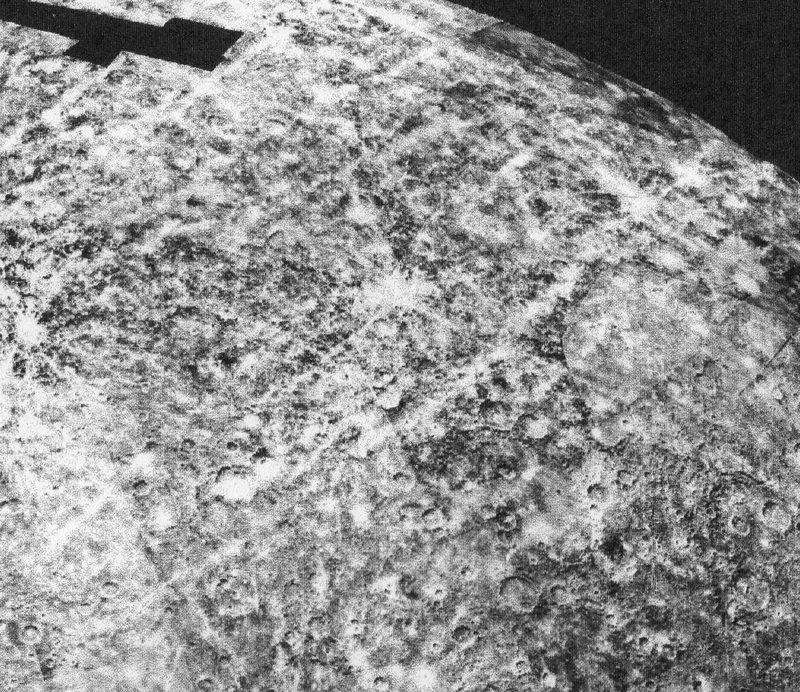 But Venus’ basalt deposit near Mercury’s north pole became highly magnetized as it approached, cooled and hardened. MESSENGER imaged the deposit (Figure 2) and its magnetic field instruments discovered that the deposit has a much stronger field than the declining field in the interior of the core, now known as Mercury. The cited paper cannot explain the fact that the magnetic field of the deposit is opposite the internal magnetic field of Mercury. This was due to the gaseous form of the deposit cooling and forming miniature dipoles in space before contacting the surface. These became oriented opposite to the field of the planet before landing on the surface, that is, with their north poles oriented toward Mercury’s south, since opposite poles attract. At the time of its final ejection of the solid iron core from Mars, Mercury was covered with a sulfur-iron surface from the mantle which adhered to it. This surface layer contained many parallel grooves scratched across its surface by the rigid rocks on the north and south edges of the Valles Marineris from which it exited (Figure 3), but had yet no impact craters on its surface. 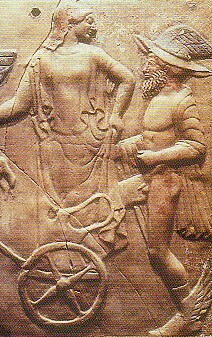 This was seen from Earth and expressed in Greek myth which stated that Hermes (Mercury) invented the Lyre. 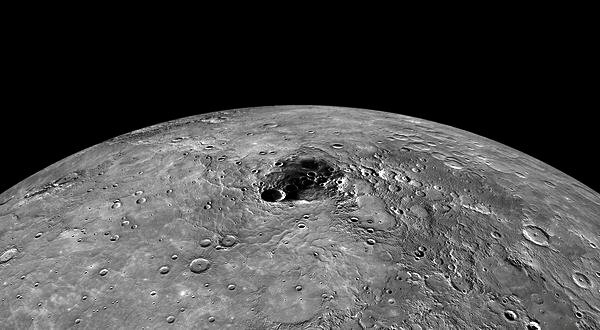 The many craters now visible on Mercury formed by rocks blasted from Mars during its encounters with the Earth, which missed the Earth and have been falling toward the Sun for the last 6 to 2.6 millennia. ~ by Angiras on October 14, 2018.